The end of the last ice age from 21,000 to 11,700 years ago was a tumultuous time. It wasn't a simple orderly transition from cold to warm. Instead, the world's climate veered abruptly from one extreme to the other, often doing different things in different parts of the world. Crucially for us it's also a time when we start to see people changing their behaviour in response to what the climate was doing. I have to admit I've got a bit of a soft spot for this period; it was the topic of my PhD research. As a student I was based at Royal Holloway, a college of the University of London, just outside Windsor in the UK. My main supervisor was John Lowe, who was heading up a large research project investigating changes in climate and the environment since the ice age. Several of John's colleagues also had big research teams working on different periods of climate change. The result was a department full of students and other researchers. Intellectually it was a fantastic time. There were always ideas bouncing around; any newly published research paper would suddenly become the focus of discussion over tea and coffee. We'd help each other on fieldwork and chat through our findings. It was always fun trying to outline your latest ideas over beers. I learnt a heck of a lot. I was keen to work on any site that might hold a clue to what happened to the British Isles after the ice retreated from the Last Glacial Maximum. It didn't matter where: a river bank in southwestern Ireland; an old brick works in southern Scotland; a gravel pit in Yorkshire; a golf course in Cumbria; an open-cast coal mine in southern Wales. Although these might sound like an eclectic mix of locations, they all had one thing in common: they were all old lakes that had formed after the ice had melted away. Over time, the lakes had filled in with sediments, preserving a record of the changing environment and climate. By the time we'd got to them, most of the lakes had long since filled in. In most cases we'd have to core a site with a bit of kit that looked like Heath Robinson had designed it. The key thing was to get several metres down so as to reach the sediments that had accumulated immediately after the last ice age. Most corers are made up of a thin-walled aluminium tube, usually a metre or so long, and look like an anti-tank missile launcher. As the corer is pushed into the ground, it captures the sediments below the surface, allowing you to analyze them back in the lab. Peats are easy; lake sediments are hard work. Thinking back, the exercise probably did look rather bizarre when seen from afar; there'd usually be a group of three to four of us, hanging off and swearing at something that looked like it should be banned under any reasonable arms treaty. In spite of all the hard work, it was good fun and a great way to try to understand how the world works. A persistent problem, however, was that the sampling tubes are usually only a few centimetres across, so we had to think carefully before running any analysis on the precious little sediment we had (corers can be made larger but are then nigh on impossible to get very deep). Fortunately a few of the sites I worked on as a research student were being eroded out from riverbanks or cliff faces, giving us lots more material to work on. Assuming we weren't suffering from lumbago after coring, we'd often see the same distinctive suite of sediments. At the bottom of the sequences would be a thick unit ofsand and gravel. This often had very little else in it and represented a time when the landscape was barren, swept clean of most life by the ice. Some time after the ice had retreated, life appears to have returned in abundance. Conditions became warm enough that plants and animals were able to colonize the landscape and live in the lake waters. The sediments shout this out loud and clear, with a clear switch to rich brown lake muds. But when it looked like the good times were here to stay, the environment dramatically changed. The organic-rich muds suddenly changed to grey clays and silts, suggesting that it had got a lot colder and the vegetation cover had been drastically reduced. Similar changes have been seen in lake sediments across the northwest of Europe. The question was how much of these changes reflected climate. Much like the ocean cores we've already looked at, lake sediments contain a lot of different fossils that can be used to reconstruct the environment and climate in great detail. Probably one of the best known is pollen. Most pollen is designed to travel on the wind and vast amounts are often produced in the hope that some will pollinate. One of the reasons why pollen is such a curse to hayfever sufferers is that many plants produce prodigious amounts of it; a single ragweed can turn out a million grains a day, while a branch of marijuana can release more than 500 million grains. Most of these never get to do the job they were intended for; otherwise we'd be up to our necks in cannabis. Instead, there's a huge amount of waste, with the vast majority of pollen grains falling by the wayside. Fortunately, this can be turned to our advantage. Some of the pollen ends up on lake or peat surfaces, eventually becoming locked within the sediments and buried underground. Although most grains are smaller than 0.01 mm across, their shapes can vary enormously. The result is that when the different pollen grains are extracted from the sediments it's possible to identify most to at least the family or genus level: for instance, hazel trees produce pollen grains that look like samosas, while pine looks like the outline of a well-known cartoon character in the shape of a mouse. By sampling layer by layer down through a core and counting around 300 pollen grains at a time, it's possible to get a good idea of what was growing in the immediate area when the sediments were being laid down. If you see a samosa you can tick the box for hazel; the silhouette of a popular mouse-shaped cartoon character, a pine. If enough levels are analyzed through a core, changes to the vegetation in a landscape can be investigated. In the early 20th century, Norwegian geologist Lennart von Post did some of the earliest work on deciphering what fossil pollen was saying. A formidable man in stature, he was the first to count different pollen grains within Swedish peat sequences. In 1916 he surprised his Scandinavian colleagues when he described for the first time how pollen might be used to reconstruct past environments. Because temperature and moisture play a significant role in deciding where plants can and can't grow, it didn't take a big leap of faith to interpret some of the vegetation changes as climate. When European scientists started looking at pollen preserved in lake sediments deposited after the last ice age, they found that there had been big shifts in the vegetation. Most critically, the rich organic muds contained pollen grains that indicated trees were common across western Europe at this time. This clearly showed that the organic muds were formed during a period of warmth now known as the Lateglacial Interstadial. In contrast, the pollen types were dramatically different within the grey clays and silts. The forest cover crashed, to be replaced by a totally different suite of plants. Arctic species became the top dog. These included Dryas octopetala, a low-lying shrub that's common today in cold environments. The conclusion was there had been a big change in temperature. Because there was so much Dryas octopetala in the period represented by the silts and clays, this interval became known as the Younger Dryas Stadial. It looked like there had been a return to ice age conditions. In Britain, there seemed to be a long-term increase in birch pollen immediately before this, suggesting it had got progressively warmer until the onset of the Younger Dryas. Were these just local changes? An obvious place to look was in Greenland. If the same changes could be seen in the ice cores it would show these were of regional significance. One of the first records from Greenland was actually taken from a site known as Camp Century, 'the city under the ice'. This bizarre place was a military installation in the far northwest of Greenland. During the Cold War, Greenland's military significance became apparent to the USA. In 1958, in fear of a Soviet military strike, Camp Century was constructed within the ice sheet so that a future counterattack might be made. The ultimate plan appears to have been to construct a vast military site, holding up to 600 nuclear missiles that could be moved around without fear of detection via a 4,000 kilometre underground railway system. Camp Century was the first phase to see whether such a scheme was possible. It was strictly men-only, with up to 250 individuals staying in an underground camp that did not want for anything. In addition to the accommodation there were a cinema, library, church, chemist, gym, barber-shop and research labs, all accessed off a main street over 330 metres long; electricity was provided by a nuclear reactor. As we know, however, ice flows. A team of 50 men in the camp were dedicated solely to keeping the tunnels clear. In spite of this, attempts to build and operate a railway failed spectacularly. By 1966 it was apparent that the movement of ice was too great. The whole place was closed and the military plans shelved. One good thing did come from all this. Towards the end of Camp Century's life, the US Army Cold Regions Research and Engineering Laboratory succeeded in drilling a core from here down to 1390 metres. The ice was analyzed by a Danish and American team led by Willi Dansgaard and the results showed that even this far north, pronounced warming and cooling had occurred. It all seemed to tie in with what the European lake sediments were saying. There was still no real way of knowing what the temperature had done, however; although the Camp Century reconstruction was based on the oxygen isotopes in the ice it wasn't calibrated against temperature. Although it's good fun saying it got colder or warmer, relative to what and by how much? Fortunately, it's not only pollen grains that are preserved in ancient lake sediments. In the late 1960s, Russell Coope almost single-handedly pioneered one of the great methods for reconstructing past changes in temperature using bits and pieces of fossil beetle remains. Of all the different types of insects, beetles are the most abundant and diverse. More than 300,000 species have been described and as such make up around a quarter of all known living things. Not only are they found around the world, but many species also have a strict preference for a particular environment. If you can identify the species from the fragments of fossil exoskeleton in the lake sediments it's possible to describe the environment in which they lived; rather wonderfully, one of the best pointers for identifying beetles are the male genitalia which are distinctly different at species level. Some species will give an indication of whether there was flowing water; others dry, sandy soils. Dung beetles indicate mammals had been about. The more exciting thing from a climate viewpoint is that many beetle species only thrive within a relatively narrow temperature range. With other colleagues, Russell Coope has been able to use this information to show how temperatures have changed in the past. As early as 1969, he was showing that the highest temperatures took place at the beginning of the Lateglacial Interstadial and not at the end, as Camp Century and the European pollen suggested. Since this early work, Coope's results have been vindicated, as virtually all reconstructions - including those from the more recent Greenland ice cores - show that the warming was greatest at the start of the interstadial. Importantly, the beetle results also highlighted one of the dangers of lining up changes in sediments to temperature. It now looks like the early warming happened within the lowermost sands and gravels and not higher up when the organic muds were first laid down; the implication is that the beetles responded quickly to the temperature change while most other animals and plants took their time to migrate back into the landscape. In terms of actual temperature, the beetles show that 14,700 years ago the summer temperatures in southern England shot up by around 7 °C to 17 °C. Things then seemed to gradually cool down across the North Atlantic, reaching a low during the Younger Dryas around 12,900 years ago. The summers in southern England dropped back down to 10 °C; a return to ice age conditions. Although a Younger Dryas summer temperature of 10 °C in southern England doesn't sound too cold, it's equivalent to today's northern coast of Siberia. At these temperatures, Brighton wouldn't have been the popular seaside resort it is today. Temperatures might have been even worse than this. If it gets too cold, many species will go to sleep, die or (if able) up sticks and move. This is a bit of headache when trying to work out what the temperature was doing in the past. Remember, this temperature reconstruction of 10 °C comes from a slab of sediment that might represent a couple of hundred years; we don't know whether this was an average or only happened once in a blue moon. We can only go with what's preserved in the mud and hope this snapshot of time is representative. It gets even worse for trying to work out what happened during winter. Living things don't do much in the coldest part of the year. If we want to see what the winter temperatures were doing, we have to go out into the landscape and look elsewhere. As temperatures plummeted during the Younger Dryas, icy conditions returned to a large swathe of northern Europe for some 1200 years. A mini ice age had returned and frozen ground was once again the norm. But the ground didn't just sit there and freeze; it heaved. All sorts of things took place at and below the surface. In some regions, the ground cracked open, allowing water to flow in and then freeze; as each winter passed, these wedges got larger and larger as the newly formed ice pushed down and out. If the conditions are right, ice wedges can become huge, measuring some 10 metres deep and 3 metres across. The key thing is that they can only form when there is an enduring amount of permafrost. If it's too warm, they just don't form. In other spots, ice under the surface swelled up, forming small domed hills - known as pingos - across the landscape. These things can be enormous, measuring up to 70 metres high and 2 kilometres wide. Because pingos found in today's Arctic grow at the rate of a few centimeters a year, the size of those from the Younger Dryas indicate it must have been cold for a heck of a long time. It couldn't last. When the permafrost melted, the ice wedges filled in with sediment and the pingos collapsed, forming big holes in the ground. Just finding these in the landscape shows there must have been a continuous permafrost during the Younger Dryas. Plotted up on a map, these features seem to have been common across northern Ireland, Britain and on into Scandinavia. Average temperatures must have been about -8 °C, suggesting the winters were as low as -20 °C. It was damn cold. When the Last Glacial Maximum ended, the British Ice Sheet went into steep decline. By the end of the Lateglacial Interstadial, there may have only been a few small pockets of ice left in the Highlands of Scotland. With the onset of cold conditions during the Younger Dryas, the ice had another chance to wreak havoc. It built up again in the western Highlands of Scotland. If you've watched Mel Gibson's Braveheart, you'll have seen William Wallace hiding from the English on Rannoch Moor, just north of Glasgow. Although it's a beautiful place when the Sun is out, most of the time it's cold, damp and wind swept. It's an ideal place to hide from the English and build up an army if you're so inclined. It's also a great place for a nascent ice cap. The ice built up here and advanced down as far as Loch Lomond. Unlike the big ice sheets we saw during the Last Glacial Maximum, it's a lot easier to use the smaller Younger Dryas ice caps and glaciers to get a handle on climate. Modern studies on slabs of ice show that summer temperature and the amount of snow they receive control their size. Essentially if relatively more snow builds up at the top of the glacier than is lost at the bottom, the ice surges forward. If the opposite happens, the glacier falls back. If the losses and gains are around the same, the glacier stays where it is and builds up a moraine. Studying today's glaciers shows they can be split up into two parts: an upper area, where more snow builds up than melts over a year, and a lower zone, where the opposite happens. Roughly speaking, when the ice is neither advancing nor retreating, the area of accumulating snow makes up somewhere between 60 and 65% of a glacier's surface. The practical upshot of all this is you can take a map, walk out into the back of beyond, mark up the location of moraines in a landscape and use this to reconstruct an extinct river of ice. Because we know from the beetles what the temperature was doing during the Younger Dryas, it's possible to use these former glaciers to work out the amount of snowfall. Looking across the British Isles, the concentration of Younger Dryas ice was in southwest Scotland and the Lake District. Using the known relationship between glacier size and climate, the amount of precipitation looks like it was around 80% of today's value. Importantly, the lack of ice in northwest Scotland shows that it was relatively dry in the far north. This pattern has been found across northern Europe. In Scandinavia, the ice surged forward once again, yet further north on the tiny island of Spitsbergen in the Barents Sea the glaciers were pathetically small. It all points to the band of high rainfall that this region gets today being considerably further south. These climatic changes appear to have been driven by what was happening in the oceans. Today, much of the rain that falls over northwestern Europe comes from low-pressure systems that sweep in from the Atlantic. First described by Norwegian Vilhelm Bjerknes during the First World War, these form on the boundary between cold Arctic air heading south and warm tropical air going north; he likened them to 'fronts' after the battles being fought in Western Europe at the time. Bjerknes realized that when air with two big temperature differences clashes, the warm air rises up above the cold, creating a low-pressure system, and generating lots of clouds and rain in the process. As we saw in the last chapter, the North Atlantic Drift currently brings warm water north. It doesn't get much further north than Norway because cold Arctic waters come south, hugging the coast of Greenland and sweeping down the east coast of Canada. This big contrast in sea temperature is known as the polar front. Because of the big differences in ocean temperatures over the western Atlantic, a lot of low-pressure systems form here, especially during winter. Because the air generally blows to the east at these latitudes, these low pressure systems then hurtle off to Europe at about 1,000 kilometres a day, dumping rain and snow as they go. What happened during the Younger Dryas? In 1981, Americans Bill Ruddiman and Andrew McIntyre undertook a classic piece of work to find out what was happening in the North Atlantic through this period. Taking a number of cores from across the region, they analyzed individual layers through the sediments to establish the proportion of warm- and cold-loving forams living in different parts of the North Atlantic at different times. They found that when it was warm in Europe, heat-loving forams lived in the far north, showing that the North Atlantic Drift was flowing in a similar way to today (Figure 6.1). During the Younger Dryas this all changed. Where it had once been warm, the forams were mostly cold-loving. The Arctic waters had moved southwards, pushing the polar front down to northern Spain. Cold waters would have enveloped much of Europe. Yet as Britain and its surroundings cooled, the temperatures in the tropics remained largely unchanged. The increasing temperature difference across the latitudes caused the westerly winds to shift south, taking much of the rain and snow with them. Figure 6.1 The swinging polar front. The onset of these chilly conditions would have had a big impact on people living in the region. When it gets cold most of us throw on another sweater or ramp up the central heating. During the Younger Dryas, our ancestors seemed to have tried something else, albeit unintentionally. In 2005, Sharon Moalem and colleagues from the Mount Sinai School of Medicine in New York made a fascinating research study on the origin of Type 1 diabetes in Europe. People with this disease have an excessive amount of sugar in their blood. It's been known for some time that there is an unusual distribution of suffers in Europe, with the largest proportion at high latitudes (particularly in Scandinavia) and in Sardinia. Type 1 diabetes is less common in people of African, Asian and native American descent. The changing prevalence across Europe is uncertain. There is no obvious reason why people living in much of the Mediterranean should be less susceptible to the disease than those in northern Europe. There's certainly no obvious benefit either. Type 1 diabetes causes a range of problems, including ketoacidosis (a nasty complaint where acid can build up to dangerous levels in the blood, leading to a coma and ultimately death), heart disease, strokes, kidney failure... the list goes on. It's nothing you'd really want to go looking for. Or is it? During the Younger Dryas, much of northern Europe returned to ice age conditions. This would have been a particular problem for people who had settled in Scandinavia during the warm interstadial. People living at these latitudes would have experienced an intense evolutionary pressure. Those who could adapt to the harsh environment and deal with the intense cold would have had a far better chance of surviving. Other species are known to load up blood sugar levels when the temperatures plummet. An excellent example is the wood frog Rana sylvatica, the only species of frog found north of the Arctic circle. As soon as temperatures drop, the wood frog's liver pours sugar into the blood and ultimately its organs. The result is nearly half of the frog's body can freeze; its heart, breathing and blood flow all stop. Yet after just a few minutes of thawing in springtime, all these physiological processes start up again without any apparent ill effects. Not only do higher blood sugar levels reduce the freezing point at which ice forms, but they also change the shape of the crystals, making them less likely to rupture tissues. Could high sugar levels in the blood of our north European ancestors have evolved to prevent the formation of ice crystals? This is something Moalem and colleagues have wondered out loud. When temperatures dropped during the Younger Dryas, those living at high latitudes would have been affected the most; individuals who produced more sugar in their blood would have stood a greater chance of survival. An increase in blood sugar levels at this time would certainly have been useful. Recent studies of the Y chromosome suggest that people in northern Europe might have a similar origin to those who colonized Sardinia, which would help explain today's distribution of the disease. Given the low life expectancy at this time - possibly as little as 25 years - it wouldn't have mattered that Type 1 diabetes didn't extend your life to what we'd now consider an old age. It just had to get you through enough extreme winters to reproduce and pass on your genes. If true, this would be the first example of where a disease has been shown to become more common as an adaptation to extreme climate change. It's a fascinating idea. could the Greenland ice core records be used to construct a chronology for Antarctica? If this was to work, there had to be some way of linking up the cores. Fortunately, the air above us is very well mixed, meaning that for most types ofgases it's possible to go from one end of the planet to the other and measure the same amount in the atmosphere. The makeup of the air bubbles trapped in the ice seemed a good place to start. During climate shifts, there have often been big changes in the concentration of some gases within the atmosphere, many a time driven by changes in the carbon cycle. We know this is true of carbon dioxide, but because of Asian dust falling on Greenland it's not possible to reconstruct past changes from this ice sheet. What we want is a gas that can be measured in both Greenland and Antarctica. A better prospect is methane, one of the greenhouse gases we're so worried about today, and one which is not significantly influenced by dust levels. It was originally thought that the recent geological changes in atmospheric methane was largely controlled by the amount of wetlands that covered the world's surface. Generally speaking, most of these are in Siberia and the tropics. When it gets warm, these areas receive a lot of rain and the number of wetlands increases. It's a recipe for lots of plant matter decomposing under water without the presence of oxygen. The result is prodigious amounts of methane can be produced. Recently, however, an important but hitherto unrecognized source of methane has been discovered. I briefly mentioned earlier the existence of icy carbon-rich soils in Siberia that are known as yedoma; it now seems possible that some of these may have started to melt immediately after the Last Glacial Maximum. The melting ice from these soils can cause ponds to form in depressions across the Siberian landscape, producing deep lakes that result in the ancient plant material from the yedoma also breaking down to produce methane. Regardless of its source, the warmer the climate becomes, the more methane seems to be put into the air; when it gets cold, the reverse happens. Once released, the gas is quickly mixed around the world, allowing a small part to be entombed within the ice. This all means that a team of scientists can come along thousands of years later, extract the ice, crush it, and measure the amount of gas trapped in the bubbles. Over the past 650,000 years, Antarctica shows that methane levels almost doubled when the climate warmed up: there were 380 parts per billion of it in the air during an ice age compared to interglacial levels of up to 725 parts per billion. Because methane only lives in the atmosphere for around 12 years, the same peaks and troughs in gas levels can be used to precisely tie together the Greenland and Antarctic ice cores. Even during shorter and more abrupt periods of climate change, the methane levels seem to have shifted significantly, ideal for linking up the records. The beauty of all this is that the excellent chronology from Greenland can be used by the Antarctic ice cores, allowing a direct comparison to the North Atlantic region. When this was done, a fascinating pattern emerged. The Lateglacial Interstadial and Younger Dryas in the North Atlantic did not happen in Antarctica. When it was warm in the north, it was cold in the south. When it got cold in the north, it became warm in the south. Did this relationship hold across the hemispheres? It's easy to forget that ice cores aren't necessarily representative of such vast regions; they are after all primarily recording climate near the poles. Perhaps the climate changes in Antarctica weren't experienced anywhere else. It's important to know. Very few people live at such high latitudes. What were conditions like closer to the Equator where most people live? A good place to look in the southern hemisphere is New Zealand. New Zealand is one of those perfect places for climate research. An island nation comparable in size to Great Britain, it's surrounded by oceans. The prevailing westerly winds slam into a wall of mountains on the west coast of the South Island, forcing the air to rise and leading to huge dumps of rainfall. As a result, this area has one of the highest rainfalls recorded anywhere in the world; 7 to 8 metres a year are not unheard of. During the last ice age, huge glaciers surged out of the mountains and dropped into the valleys below. If you ever get a chance, take a cruise in Milford Sound, a fjord in the southwest of the island. Assuming you can see through all the rain, you'll find a textbook example of an ice-forged landscape: sheer cliffs mark the limits of where the once vast glacier flowed, while hanging valleys show where small glaciers fed into the main ice mass; it's a magical place. Warming at the end of the ice age caused the glaciers around the country to rapidly melt, retreating back up into the mountains where some can still be seen today. One of the best examples is just up the coast from Milford Sound at Franz Josef Glacier. Franz Josef used to be a sleepy place on the West Coast. Now it's a bustling tourist town used as a base by thousands to visit the stunning glacier in the adjacent valley. Yet on the other side of the town there is a huge mound of dirt and rubble that most people ignore as they hurtle along the road to go to the next tourist spot. This enormous U-shaped moraine is known locally as the Waiho Loop and is large enough to be marked up on most maps. Recent modelling of how the glacier responds to climate has shown that over the long term, the Franz Josef mostly responds to temperature. To get the ice all the way out to the Waiho Loop would suggest that the temperature had dropped by somewhere between 4.1 and 4.7 °C. The question was when had this taken place? I've been fortunate to visit the area several times and was intrigued by the Waiho Loop's age. Early work had concentrated on radiocarbon dating wood fragments that had been trapped in sediments as the ice had advanced down the valley to the Waiho Loop. The results had suggested the advance had happened at the same time as the Younger Dryas in the North Atlantic. This caused quite a stir because it suggested that the world's climate was cooling down in both hemispheres at the same time. Not everyone was so sure, however. Early on it had been argued that the samples used to date the advance of ice were contaminated. Radiocarbon dating uses the principle that virtually every living thing is radioactive; fortunately the amounts involved are minuscule and are nothing to worry about. The method is based on the fact that a radioactive form of carbon is created in the upper atmosphere as a result of the bombardment of nitrogen gas by high-energy particles from outer space. The end product is radiocarbon - sometimes referred to as carbon-14. This quickly gets turned into carbon dioxide with the result that it can then be taken up by plants via photosynthesis. 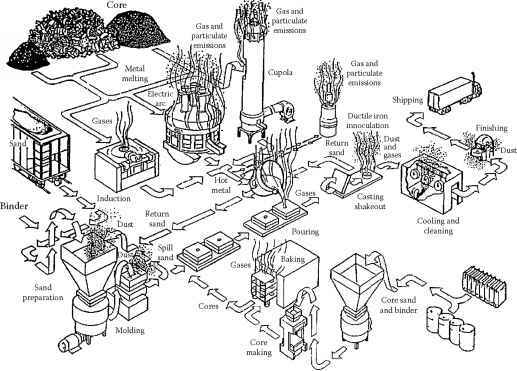 The plants get eaten and the radioactive carbon goes up through the food chain. When alive, most plants and animals have the same amount ofradiocar-bon as the air. As soon as they die, the radioactive carbon starts to disintegrate, turning back into nitrogen. Every 5,730 years, half of all the radioactive carbon disappears. By measuring the amount in a sample and making an assumption about how much there was in the first place, it's possible to calculate an age. Younger Dryas was not global. The south Pacific was dancing to the same tune as Antarctica. The ice cores from Greenland and Antarctica show the same sort of seesawing pattern in temperature that we saw with the Heinrich events. A change in sea level, however, doesn't seem a likely cause of the different trends seen across the world at this time. Immediately after the Last Glacial Maximum, a large amount of the world's ice sheets were still intact. As a result, vast areas of continental shelf were still above water. One of the largest was off southeast Asia. Here the islands of Borneo, Sumatra, Java and Bali all joined the continent, forming the enormous Sunda Shelf of 1.8 million square kilometres; this is equivalent to the size of Mexico. The latest work on sea level change shows that much of this area flooded during a single large rise of 16 metres over just 300 years. The dating, however, shows this happened around 14,300 years ago, far too late to have caused the Lateglacial cooling around Antarctica and too early to be the source of the Younger Dryas in the North Atlantic. It had to have been something else. Carbon dioxide levels rapidly increased in the atmosphere after the Last Glacial Maximum. As mentioned in the last chapter, the Southern Ocean is a major player in controlling the uptake and release of carbon dioxide from the deep sea and this seems to have closely tracked the temperature changes seen in the Antarctic ice cores. When it was warming up, more carbon dioxide was being belched from the Southern Ocean. Although this put the world on a fast track to interglacial levels of greenhouse gases, these changes were being driven by a warming world rather than the other way round. Carbon dioxide can't have been the cause of the temperature trends. A possible solution lies in the north. At this time the Laurentide Ice Sheet continued to cover a large part of North America. As conditions began to warm over the North Atlantic, the ice began to melt. Not all of the freshwater flowed into the sea, however; a large amount ponded up inland, building a vast lake, known as Lake Agassiz, over what is now central north Canada. Today's Great Lakes to the south are just small fry compared to the size of Agassiz. Over its 4,000-year lifespan, the lake greatly changed in size as it periodically lost huge volumes of water. An army of researchers have walked over this landscape, mapping and dating the old beaches, spits and escarpments left behind. During the Lateglacial, Agassiz looks like it reached a size of 300,000 square kilometres; it was larger in area than the United Kingdom. Originally it was thought that just before the Younger Dryas, Lake Agassiz managed to find a weak spot in the ice and drain out via the east coast, capping the North Atlantic with freshwater, shutting down deepwater formation and disrupting the thermohaline circulation. One problem with this idea is there is no clear evidence of a big pulse of freshwater into the western Atlantic at this time; there's not even a significant layer of rubble that we saw with the Heinrich events. The amount of freshwater released can't have been that large either because there wasn't a big jump in sea level at this time. Whatever happened had to be more subtle than this. When researchers have gone back and redated possible escape routes for Lake Agassiz along the east coast, the ages are all too young for it to be the cause of the Younger Dryas. An alternative has been suggested. Jim Teller at the University of Manitoba and colleagues have proposed that Lake Agassiz may have poured into the Arctic from the northwest. A computer simulation of how the North American ice evolved over time supports this idea. It is possible the freshwater took this route and continued round the back of Greenland before flowing into the North Atlantic. If so, this release of water would have bought tonnes of sea ice with it from the Arctic, forming a barrier to deepwater formation. Inadvertently it would have been a remarkably effective way of shutting down the circulation in the north. Compared to Heinrich events there wasn't a sea level rise of up to 35 metres. In fact there was hardly any noticeable change at all. Yet deepwater formation took over a thousand years to recover, plummeting the region into a mini ice age. It just goes to show that it's not what you've got that matters, it's what you do with it that counts. The transition from the end of the last ice age into the current interglacial was far from smooth. A whole host of different things were going on in different parts of the world. At one level, the changes that happened are very similar to those that took place during Heinrich events. But rather than an armada of icebergs streaming off the North American east coast, it seems likely that a pulse of freshwater from the melting Laurentide ice poured into the Arctic, shutting down deepwater formation and cooling the North Atlantic for over a millennium. Excitingly this might not be the end of the story. A new idea has just come out of left field. A team of scientists and archaeologists led by Richard Firestone at the Lawrence Berkeley National Laboratory in California have got together and argued that a comet more than 4 kilometres across may have exploded over North America at the beginning of the Younger Dryas. The people who inhabited North America immediately before the Younger Dryas are known as Clovis; named after the New Mexico town where their distinctive flute-shaped stone tools were first discovered. These people appear to have prospered immediately before the Younger Dryas, hunting weird and exotic creatures in North America that included mammoths. They were clearly able hunters and apparently capable of dealing with climate change; the oldest well in the USA is Clovis-built, showing these people could access water when it got dry. Yet around the beginning of the Younger Dryas, the Clovis and mammoths disappeared; a people bearing different stone tools and hunting smaller mammals, such as bison, replaced them. Before 2007, the big toss-up was whether it was humans or climate that wiped out the mammoths. Now we can throw into the heady mix a cometary impact. The team appear to have found some 25 sites containing little metal balls, shocked quartz, exotic elements - such as iridium -and black mats of carbon that all suggest a comet exploded over North America. The critical thing is all these things have been discovered at levels in the ground equivalent in time to when the Clovis and mammoths disappeared and the Younger Dryas began. Perhaps surprisingly, there is some indirect support: there is little evidence of anything like the Younger Dryas happening at the end of earlier ice ages; when it had warmed up in the past it stayed warm. This suggests something unusual happened during the Younger Dryas. There's no obvious evidence of an impact crater, suggesting that if real, the comet either exploded in the air -spreading material all over the continent - or the ice sheet was large enough to absorb the hit. If so, was the impact big enough to melt enough ice to let Lake Agassiz escape - possibly into the Arctic - and cause the Younger Dryas? It's too early to say whether a comet really did cause the Younger Dryas. It's an absorbing idea but only time will tell. If true, it's a nice (though not very comforting) example of where a freak event can cause devastating climate change. It's something we can do very little about. Yet even here there is a lesson. The climate changes that happened at this time were clearly felt by our ancestors. Ultimately, the Clovis culture couldn't continue in the changed climate and environment of North America. In Europe, our ancestors retreated to sunnier climes and arguably may have begun to suffer more from Type 1 diabetes. As we continue with our story, we'll see other examples of how people in the past have responded to climate change.